Discounter says "The Hub" Web site was a temporary back-to-school promotion; some analysts think Wal-Mart had bigger hopes. NEW YORK (CNNMoney.com) -- Wal-Mart pulled the plug on its teen social-networking endeavor called "The Hub" after only 10 weeks. Wal-Mart (Charts) spokeswoman Linda Blakely told CNNMoney.com that the Web site was meant to be a back-to-school initiative. The site showcased the retailers' back-to-school clothing and other related offerings. Additionally, visitors to the site could build their own personal pages, similar to the feature offered by Myspace.com. "It ended when the marketing program for the season was completed," she said. However, at least one expert said he suspects Wal-Mart created the Web site hoping to successfully create a Myspace-like destination for teen consumers. "Why ask users to create their own profile if the site wasn't going to be around? That doesn't make a lot of sense. The very name 'The Hub' suggested a bigger strategy," said Greg Sterling, analyst with research firm Sterling Marketing Intelligence. "If The Hub was successful don't you think that Wal-Mart would've wanted to maintain it and build it into something larger? It clearly didn't work and their excuse sounds more like a face-saving effort," he said. The fact that Wal-Mart wanted to get into the social networking space is a smart move, Sterling said, "but the execution didn't work." "Perhaps it became transparent to the user that the site was just too much of a marketing channel for Wal-Mart and not a true networking site," he said. 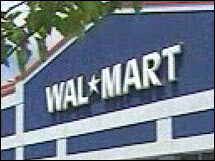 "I think the site potentially could've been successful if Wal-Mart retooled it and gave it more time to grow." In a comment e-mailed to CNNMoney, Wal-Mart.com spokeswoman Amy Colella said the retailer "will continue to evaluate this program to determine our back to school options for next year." Meanwhile, the world's largest retailer is pushing ahead with other initiatives. On Thursday, Wal-Mart announced it was accelerating its $4 generic prescription program statewide in Florida nearly four months earlier than expected. Wal-Mart's rival Target (Charts) said it too would match Wal-Mart's lower prices on the generic drugs in all Florida Target pharmacies beginning Friday, the second time in a month the discount chain has immediately matched the moves of its larger rival.